Damien Hirst is offering a free print to someone who can come up with the best caption for him in his underwear. 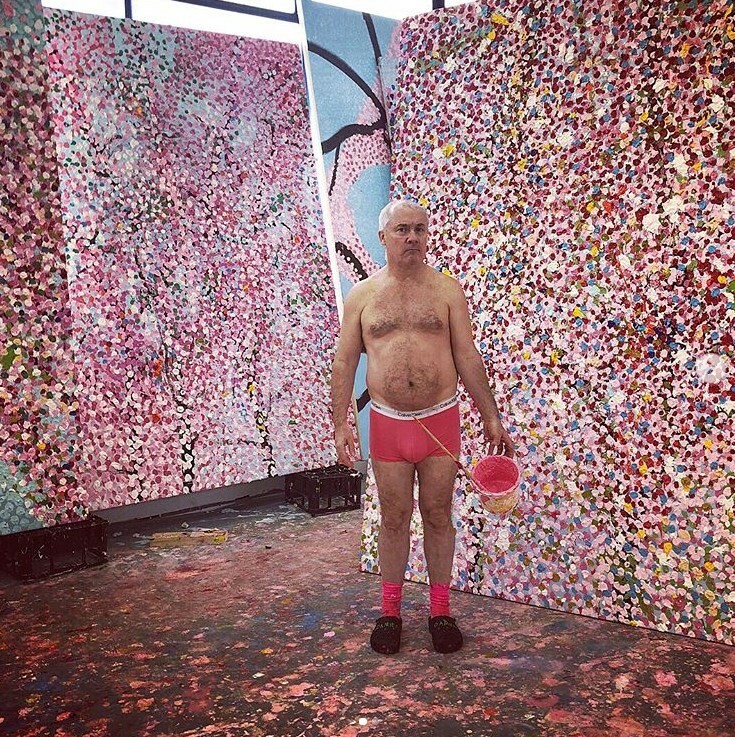 The artist posted an image of himself to his Instagram – where he’s followed by over 427,000 people – wearing pink Calvin Klein boxers and matching socks as he works on a large dotted pink painting. “I made a series of prints of my veil paintings to support the Serpentine Galleries. Whoever gives the best caption to this photo can have it,” he wrote. The pointillist-like print he’s giving away is titled “Andromeda”, while his other limited edition prints from the series – titled “Sans Souci”, “Andromeda”, “Garden of Dreams”, and “Cannizaro”, are available for sale from HENI Editions. As Artnet reports, “Andromeda” is worth £2,500. “Pantasy in pink,” suggested one user, while others offered “Damien and clothes (divided)” and “Perseus in Pink”. One of the most successful and wildly controversial artists of our time became much more personally active on his Instagram earlier this year. He found a more confessional, biting voice, captioning his 1988 “Boxes” piece “It looked like something crap made on a kids’ tv show”. Speaking of his “The Golden Calf”, he added a more personal perspective to the iconic piece for the first time ever, stating that it represented the end of an era in art. Hirst related on his IG post that he will decide a winner sometime in the next week. So go on, get captioning.